OWC has launched its new docking solution aimed primarily at Apple’s latest Thunderbolt 3-equipped MacBook Pros. Designed to be the “one dock to rule them all", OWC's Thunderbolt 3 Dock aims to be the most capable TB3 dock on the market, offering a rather sizable selection of both contemporary ports as well as legacy ports that are still be used by various professional applications. When Apple launched its latest MacBook Pro laptops late last year it received a decent amount of criticism about the notebooks only offering only four Thunderbolt 3 ports for wired connectivity, leaving behind USB Type-A, SD card reader, mDP, and some other things that many people are so used to. At the time, Apple said that docking solutions set to emerge in the future would add ports to the new MBPs and throughout 2017 we have seen a variety of TB3 adapters and docking stations launched. While these products solved mainstream, or, by contrast, specific needs, there were no docking station for the latest-gen MacBook Pro to feature (almost) every popular port that is in use and legacy connectors for those who still need them. The latter are important as Apple has a lot of loyal customers from audio/video industries, some of whom still use have to use FireWire and S/PDIF connectors. 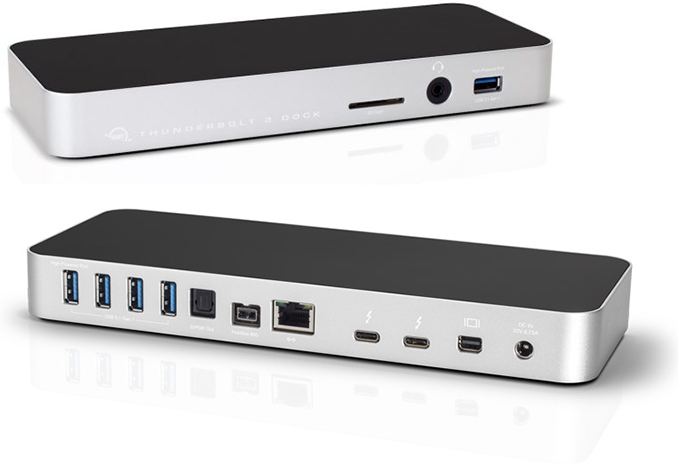 OWC’s Thunderbolt 3 Dock, in turn, is adding both contemporary and legacy connectors to the latest MBPs and other laptops with Thunderbolt 3. 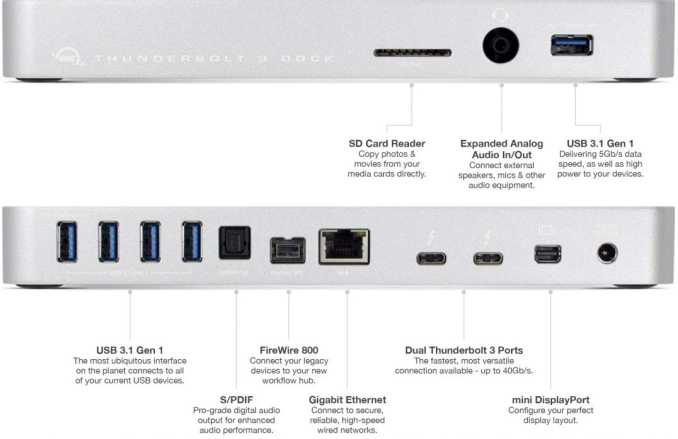 In terms of common ports, the OWC Thunderbolt 3 Dock has five USB 3.0 Type-A ports — one on the front and four on the back. Five fully-fledged USB-A connectors is a rare feature for any docking solution, but in a bid to serve certain specific needs, OWC decided to install this number of headers. The OWC TB3 Dock also has an SD card reader, something that would please professional photographers who uses such cards, and for professionals from the audio/video industry an S/PDIF output, a FireWire 800 port, and an additional 3.5-mm audio in/out to connect speakers, mics, and other equipment. While S/PDIF is (still) found on many desktops nowadays, FireWire is becoming increasingly rare. Both are virtually non-existent on contemporary mobile computers, so OWC is addressing a market that is not addressed by PC makers as well as by numerous makers of TB3 adapters/docks. Moving on to higher bandwidth ports, the dock has both a Gigabit Ethernet and a mDP 1.2 port, both of which are quite popular in both consumer and business environments. Finally, the OWC Thunderbolt 3 Dock has two more full-feature TB3 ports to enable users to connect other TB3 devices. For example, these connectors could be used to plug two 4K displays or a 5K monitor to a non-TouchBar MacBook Pro that has only two TB3 headers one of which will be occupied once the OWC TB3 Dock is plugged in. Obviously, it is simply convenient to keep the display plugged to a dock with all computers and then connect everything from a USB keyboard to speakers to a monitor using just one TB3 cable. OWC does not disclose how the 13-in-1 dock works, but the complexity of the solution is evidently very high. USB, SD, GbE, FireWire as well as S/PDIF and 3.5-mm in/out audio port require separate controllers. These controllers have to connect to a hub via PCIe bus, underscoring both the flexibility of TB3 and why TB3 devices can also cost so much. OWC has already started to ship its Thunderbolt 3 Dock, and the product is available directly as well as from retailers like Adorama, B&H Photo and others. The dock is priced at $299, which although still better than some other TB3 docks on the market, is still at the other end of the spectrum comparable to a price of a complete cheap notebook. Though given the number of PCIe-to-X controllers inside, I'm not all that surprised at the price. Okay, I checked all documentation and data sheets I could find but the information really is that lackluster. So it does include the power brick, however it does not say how much juice that'll provide at maximum. The TB ports do seem to support USB PD and according to the overview video it's up to 65W (would have wished for more, but okay), the USB A ports do support the "High Power" USB battery charging with 1.5A. It does list the used chips, e.g. the "Ultra fast" Gigabit Ethernet port is powered by Intel, so at least that is good.